March Madness is upon us, and Up to Snuff has its own Cinderella story. 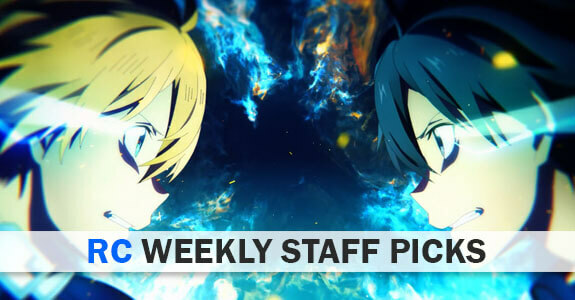 With only two more weeks left after this one, it seems as if Dororo is going to wind up as the overall #1 pick of our writers. 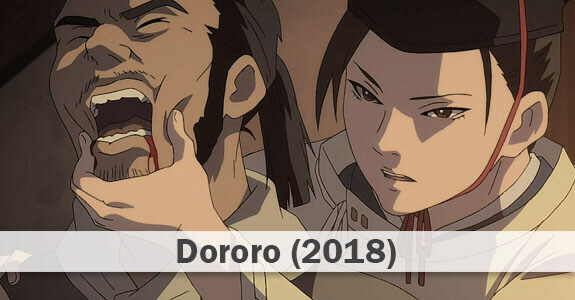 While it’s swapped the top spot with Mob Psycho 100 II several times (and nothing else has cracked their stranglehold on the top two spots all season) Dororo has reigned supreme for six of the nine surveys, including this one. That’s a pretty big upset, especially when you consider that MP 100 has hardly been a disappointment. It’s a testament to just how much this series has exceeded expectations (including mine). 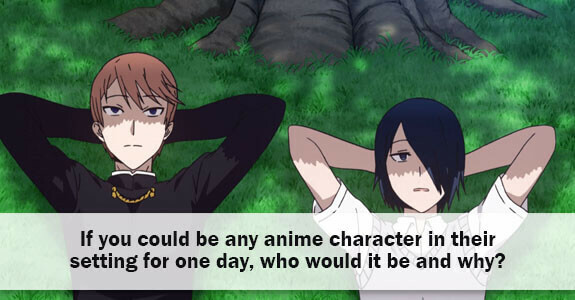 Meanwhile, our writers weigh in on the question of which anime character they’d like to be for a day, if they could make that wish come true. After some general overthinking on this we certainly have an interesting batch of answers, and a general consensus that this question was the hardest one of the season. If you could be any anime character in their setting for one day, who would it be and why? Enzo: Somewhat to my surprise, this has proved the toughest AtW question to answer this season. I did think about saying Tanaka-kun from Tanaka-kun wa Itsumo Kedaruge – that school (it’s a real high school in Hiroshima) is fantastic, and frankly I could use the practice in relaxing, But that seemed a little too mundane. So let’s go with Ginko in Mushishi – an answer I can only give because I know I get to leave at the end of the day, as this guy’s got a really tough life. But to know how it feels to be so connected to the mystical world that he’s connected to – and to have that world be so fabulously beautiful and mind-altering – seems as if it would be a truly remarkable experience. Choya: It would be great to spend a day in the universe of Fate spin-off Emiya-san Chi Kyou no Gohan as our titular protagonist Emiya Shirou. Far gone are the despairing events of Stay/Night as I would be able to regularly cook for Fuji-nee, Saber, and whichever of my acquaintances invite themselves over. Might be a copout to choose the spinoff where people aren’t risking life-and-limb to battle to the death with servants and magecraft, but who could resist a peaceful life of culinary pursuits with loved ones? Stilts-ojii: Though I’m behind on the manga/anime, my answer is either Natsu or Gray of Fairy Tail. Or Erza, or Wendy, or Gajeel, or any of a ton of characters! I just want to run amok in the fantastical but fundamentally kind world of Fairy Tail (and as part of the titular guild), where I could play with magic for a day and feel strong and awesome without being at too much of a risk of a grimdark demise. The biggest risk is that I wouldn’t want to leave. It’s a serious risk. But if I had one shot, one opportunity, that’s where I’d go. And even if I ended up as Natsu, I’d still randomly take my shirt off like Gray, ’cause have you seen their abs? Who wouldn’t! Stars: This took more pondering than you’d think. The important thing, for me, was not dying. I’ve seen enough deconstructions of isekai to know that choosing your environment unwisely would be an unpleasant experience, to say the least. Even with this character’s memories and knowledge, if I were to choose a Heroic Spirit or a gladiator, the survival rate is low. However, being Archer from for an entire day might just be worth the risk. I binged the series recently and, unfortunately, joined this bandwagon about 5 years late. What can I say? Confidence is cool. The irony here is I want to be him more than he does. In addition to his powers, snarky personality, and good looks, he gets to spend time with Rin, who is an absolute delight. As of right now, I can’t think of anyone I’d rather be, or any better company. Let’s win the Holy Grail together, Rin! Passerby: For a scenario like this I would usually be plotting of a way to exploit it, like by taking the place of some god-character, experiencing omniscience, then taking useful knowledge back with me to my own world that will make me so rich and powerful I can hire Jeff Bezos to microwave my caviar. But perhaps I’ll have a happier time if I just treat this like a hypothetical alter-world holiday, in which case I would like to spend a day as the titular Sakamoto of Sakamoto Desu ga?. Sure, there are certainly more interesting worlds in anime to visit and characters with flashier superpowers, but I would hazard that there is no skill set more practical than the ability to be effortlessly awesome in even the most mundane situations. I want to know how he does it. no rusty voice gal? god that episode was fantastic. and her voice, hngg. that’s top1 for me forever. then, of course, rainbow episode. and watahiko one. from the second, that be the well girl and don’t-step-on-shadow. Still glad I picked up and caught up on all of Mushishi at Enzo’s recommendation back in 2014. My favourites from the first season would probably be “The Green Throne” (episode 1! ), “To Sleep in the Mountains”, and “Picking Empty Cocoons”. From Zoku Shou, “Beneath the Snow”, “Lightning’s End”, and “Fragrant Darkness”. It’s hard to pick the best ones nevertheless, most are good! I’d pick Ash for certain, IRL Pokemon are too strong of a lure to pass up. I will go with the first thing that came to mind: Agetarō from Tonkatsu DJ Agetarō. Seriously, I would want to be a different anime character every day of the year. A very underrated show, that. Ginko and Shimogamo Yasaburou are very good picks. I myself would go with either Marika from Mouretsu Pirate and just be space pirate for a day (or maybe one of the crew of the Bentenmaru. Having the lead on a spaceship might be stressful) or Sakamoto from Nichijou because who wouldn’t want to be a talking cat. Also, I expect Mob to take back the number 1 spot next week, even though I haven’t seen yesterdays Dororo yet. Mob Psycho had such a good episode! Going to be one of the toughest votes yet.